Hello, Re-fashion Co-Op! This is my first post on this site and I'm really excited to be sharing my refashions with so many other awesome refashionistas :) I've been blogging at Accidental Seamstress for 2 years now and I'm officially hooked on DIY fashion. My name is Laura and I'd like to share my "Memorial Day Dress" with you first. I got this awesomely ugly 90s dress for only .99 cents. That's my "rule." I never go over $1 when I'm scouting out refashions. This just needed a few tweeks to make it "cookout" worthy for the holiday. I put it on my homemade dress form and took it in. I also raised the shoulders a little bit, and I seam ripped off those horrible side ties and decorative buttons. I finished that raw bottom hem with my favorite hem of all time: A rolled hem. Easy peasy. And, this one is easily a new favorite :) If you'd like to see a more detailed description of what I did, feel free to see my original post. Welcome to the Refashion Co-op! I look forward to more of your refashions! I'm so jealous that you're able to find great finds for $1 or less -- I have a hard time finding great steals likes that. 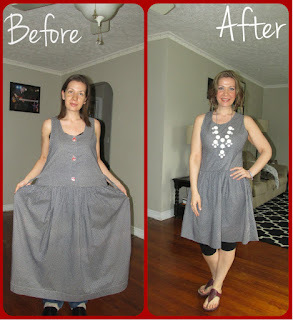 Great refashion -- I would wear the dress all the time. Looks great, well done! I can only join Jennifer in being jealous about $1.00 finds. Looking forward to more of your work! Love your ''new'' dress. I have ugly 90s dress as well , even little similar, you gave me nice idea, thank you!